Step 1. Whisk yeast into milk until well combined, and leave to sit for 5-10 minutes until it becomes frothy, which means the yeast is activated. Place flour, sugar, baking powder and salt in the bowl of a mixer and stir to combine. Step 2. With the mixer running, using a dough hook attachment, slowly add the yoghurt, eggs, olive oil and then milk mixture, until combined into a dough. Step 3. Mix until you have a soft, pliable dough. If your dough is a little dry, you can add some more milk or water. Step 4. 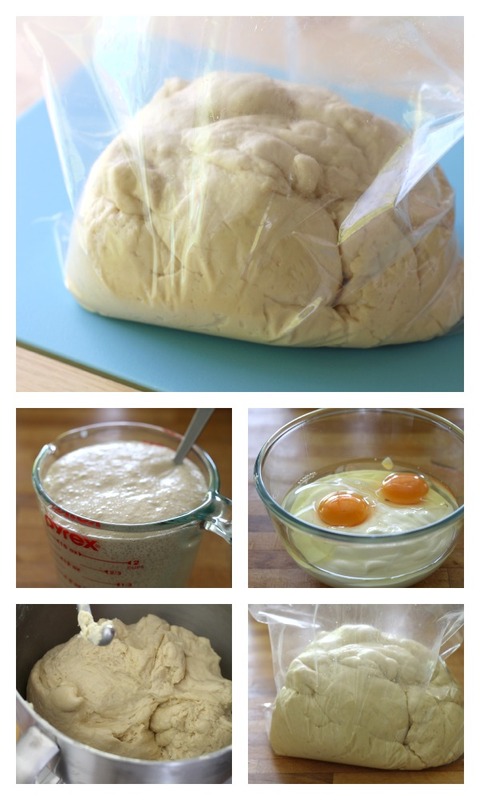 Place the dough in a large plastic bag, and leave in a warm place for 20 minutes, until the dough rises and expands. You can use the dough immediately or place into the fridge to use within 7 days. To make focaccia, roll out the required portion and bake on an oiled tray in a preheated 220°C oven for 20 minutes. To make pizza, roll out a round base and top with tomato sauce and favourite toppings. Bake in a preheated oven at 220°C for 15-20 minutes, depending on the thickness of the base. To make rolls, knead and roll equal-sized balls and place together on a tray. Bake in a preheated oven at 220°C for 15-20 minutes, depending on size. If this recipe has too many ingredients then try our 2-ingredient pizza dough instead. You can use this dough to make delicious Calzone. This Healthy hoisin chicken pizza is packed full of flavour. If you want a more traditional recipe then try this Margherita pizza recipe. Are you trying to go carb-free? Then these Healthy zucchini pizza slices are ideal. If you want to make pinwheels for lunchboxes then try this Lunch box pizza pinwheels recipe. You could also make these Pesto and cheese scrolls and Pizza scrolls using crazy dough. If you like a savoury scroll then try these Bacon, spinach and feta scrolls.